THE SCENE: Definitely shorts weather. F3 WELCOME & DISCLAIMER: Given. Gave mission of F3 and PAX named the 5 components of each workout. AMRAP – 1 Minute Each – PAX were instructed to remember the # of reps for these 3 exercises. AMRAP – 1 Minute Each – Goal was within 5 reps of the first AMRAP exercise. Gunshow, Gomer, Chuck E Cheese, Tremor, Shazam, Speedy, Grimace, Big Mac (0 FNGs). If you want to be a great runner, you can’t only run. YHC had a running injury from not correctly strengthening the muscles and tendon used in running. Cross training is a great way to strengthen the other parts of your body that contribute to running. Our spiritual fitness is similar. Just going to church once a week without consistent scripture, prayer, fellowship, and other spiritual exercises will lead to spiritual weakness and the illusion that you’re doing the right thing. Spiritual Cross Training requires that we work our whole spirit similar to how we should be exercising our whole body. Lifting up Chuck E Cheese, his M, and his new 2.0. Continued prayers for Bailout and his wife’s recovery. Weight Loss Challenge just started. Do it. APFT at The Annex on Friday. SSH x 6 IC then Radio Silent 7-12=NAILED IT!!! Never underestimate what we should be thankful for and how our behavior as HIM in the community affects those we love. Privilege to lead these men today. 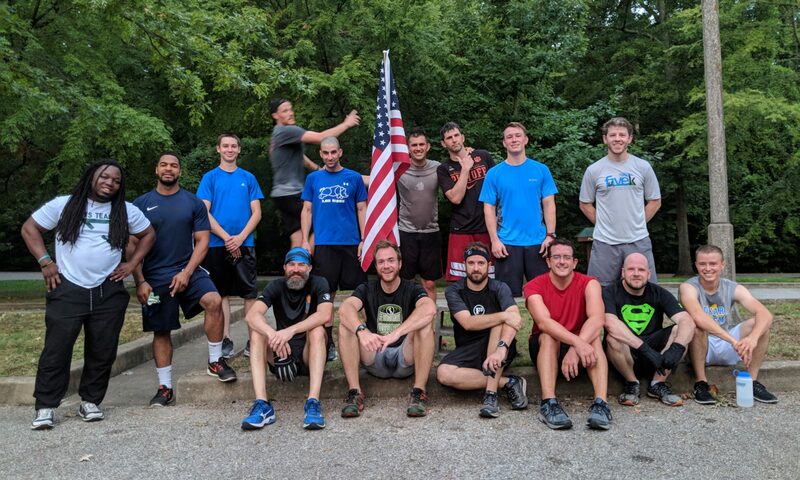 FNG got smoked along with the rest of us. Always a good time at the Banannex. Dark, early, not too cold. 5 PAX (Speedy, Slots, Sonic, Photoshop, Meter Maid (QIC)). No FNGs. 1. Positive Expectations: Take 100% responsibility. 2. Know Your Current Location: Know where you stand currently. 3. Determine Your Destination: Set goals. 5. Collect Features as You Go: At certain points, confirm you’re headed towards your desired destination. 6. Have a Stopping Point: Every so often, take a break and evaluate how you are doing. Qsource lunch at Whole Foods today. Speedy doesn’t like Whole Foods; he takes his own salad when he goes. vents, 2nd or 3rd F opportunities, and any other announcements. Do you show your M that you appreciate her and all she does to support you? Mine is injured and I can tell you I miss everything she does on a daily basis. Here are some easy ways to show her you love her (most could apply to your Mom for the younger HIMs. Tell her some random thing you appreciate about her. Take out the trash…just do it some time. Pick her some flowers…find some wild ones…or a neighbors. Stop her and pray over her. Pray for her strength, protection, wisdom, and that she would never forget she is loved. Great Mumblechatter today as the men pushed hard to complete both miles. Definitely need to use the playground for the sit-up portion of APFT. THE SCENE: The sheer essence of “gloom” was upon us. Shorts weather for most, but not all. Given. Then given again to Tremor IC during SSH. Speedy is much better at giving the disclaimer IC while doing SSHs. Imperial Walkers (I feel like we did these, and they’re in my notes, but I can’t remember). Mosey w/ CMUs to playground. 10 minutes of AMRAP Arms. 10 minutes of AMRAP Legs. CMU Optional. 10 Minutes of AMRAP Abs. Mosey w/ CMU to StartEx. 10 Minutes of AMRAP Abs as described in the above section. Life is hard. Having a group of men to lean on for encouragement and prayer is needed. Referenced James chapter 1:2-4 and discussed how trails produce perseverance. Linkin Park, Will Smith, and Dub Step on the jam today. No Evanescence. Much complaining about calf raises and Billy Blanks’ use of them. Prayers for those that just had 2.0s or will have 2.0s in their near future. Life can be fragile, babies are resilient, God is good. 20 year anniversary for Gun Show! If you completed the Crucible, post at the Annex soon to sign the nanner flag. THE SCENE: nice weather. YHC was bundled up due to it being under 60. Started the tires stacked on each other. IC 20 tempo dips, 20 reverse lunges each leg, traveling derkins full rotation around the tire. With the remaining 5 min we paired off, stacked the tires for some shuffle tire tag (kudos to slots for making tag great again) each pax squared off on opposite sides of the tire. The “it” pax had to shuffle around the tire and tag the other pax. Could not reach across the tire. No one avoided being tagged. Mosey to flag. It is yhcs F3niversary. I’m full of thanks for all the pax who I have met and experienced nothing but helpfulness and giving from everyone. F3 has changed me for the better, physically, emotionally, and always pushes me to be a better man. Everyone gives what they can. I have seen great generosity from everyone involved to help our own, and thoes in need in our community. There isn’t anything like it. Onward. Kudos to slots, he got yhc out of my shell with my first Q and subsequently aoq. For all you “regulars” Thanks for all the encouragement! THE SCENE: Insert info about the weather, etc. It’s a FREE thing. You wouldn’t understand. SSH x 30 IC, Daisy Pickers x 15, Am Hammers x 30 IC, Mosey around trail to far baseball field. Partner 1 backpedals 50 yards, does 5 Bobby Hurleys, sprints back to take over where Partner 2 is on total count. Freddy Mercury x 30, Guantanamo (Chinese Fire Drill Style) x 2.5, Wall Sit x 2 minutes. Men, we are often our own worst enemy when it comes to communication. Whether you are newly married or a veteran, you should have come to understand that the way you and your wife communicate will determine the happiness of your household. Happy wife / Happy life. By nature, men are fixers. We want a small explanation of the problem while we are putting on our hero outfit and cape so we can spring into action and fix the problem. Women usually want to explain in detail what is going on, and they expect us to do something we rarely do well… listen. In the business world, a hard truth is: “People have the shocking inability to communicate effectively”. But God doesn’t want that for our marriages and relationships. He wants clear, sound, truthful, kind, and open communication with each other. One of the biggest things we should pray for is wisdom. We should want to know the mind of God in every situation in our lives. We need to store up knowledge and communicate effectively with our wives or potential wives. One of the best studies to do for relationships is “The Five Love Languages” by Gary Chapman. It talks about the process of finding your love language and how you like to be communicated to. Once you and your wife have determined what your love languages are (there are usually two), you can then understand how to communicate to each other. If her love language is quality time and you keep giving gifts with no appreciation from her, it gets frustrating. It’s important to learn how someone communicates and then communicate that way toward them. It sounds very basic, but it’s one of the most overlooked things when it comes to communication. As with anything, you will only get out what you put into it, and communication is at the heart of everything. Semi regretted doing so much leg work for Crucible guys. Nah. Additional training is all it was. THE SCENE: Almost shorts weather….. almost. warmer and dry. F3 WELCOME & DISCLAIMER: Given, mission n 5 principles given. Re disclaimed Photoshop and Interweb…. but it was ok cause they brought Gibsons. 9 stations for 9 Pax. 1 Min AMRAP then rotate. Recovery Mosey, Then rinse and Repeat. Briefly spoke about mental heath issues. Statistically we will come into contact with someone or personally experience some sort of mental health issue. These are just US stats…. a little dated. Suicide: 41,000 a year. one every 13 min. 110 take their lives each day. 3500 attempt to do so. Mental heath isn’t a dirty word, its a reality. If you don’t deal with any of these conditions be thankful. Others don’t choose to wake up feeling like they do. Medications help to varying degrees but with unwelcome side effects. There isn’t enough affordable mental health options available to everyone who needs them. Suicide isn’t a dirty word, asking someone specifically if they want to self harm is not going to put the thought in their mind…… its already there. Be the cathartic relief if you are able to. If you know of someone who has struggled in the past let them know you are thinking about them and ask how they are doing. If you missed out on men’s breakfast its going to be a few more months before it rolls around again. A total of four cones were setup at two different concrete pads. Next to each cone was a notecard with exercises. Round 1 – all exercises were 20 reps; bear crawl between cones on each pad. Round 2 – Flipped notecard and did the following exercises (20 reps each); bear crawl between cones on each pad.